This is “Policy Effects with Fixed Exchange Rates”, chapter 12 from the book Policy and Theory of International Finance (v. 1.0). For details on it (including licensing), click here. Government policies work differently under a system of fixed exchange rates rather than floating rates. Monetary policy can lose its effectiveness whereas fiscal policy can become supereffective. In addition, fixed exchange rates offer another policy option, namely, exchange rate policy. Even though a fixed exchange rate should mean the country keeps the rate fixed, sometimes countries periodically change their fixed rate. This chapter considers these policies under the assumptions of the AA-DD model. It concludes with a case study about the decline of the Bretton Woods fixed exchange rate system that was in place after World War II. Preview the comparative statics results from the AA-DD model with fixed exchange rates. 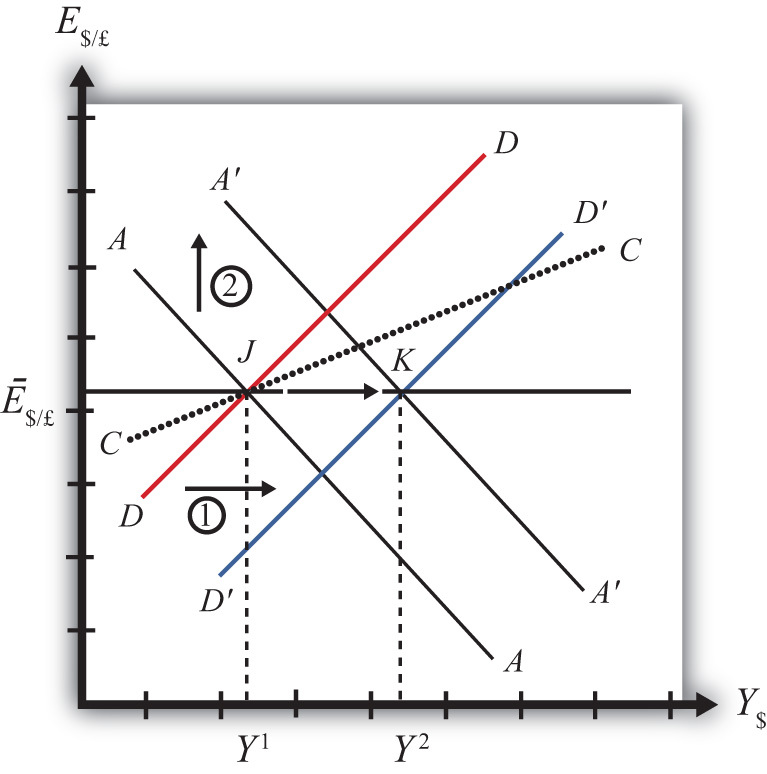 This chapter uses the AA-DD model to describe the effects of fiscal, monetary, and exchange rate policy under a system of fixed exchange rates. Fiscal and monetary policies are the primary tools governments use to guide the macroeconomy. With fixed exchange rates, a third policy option becomes available—that is, exchange rate policy. Thus we also examine the effects of changes in the fixed exchange rate. These exchange rate changes are called devaluationsWhen the government lowers the value of its currency with respect to the reserve currency or to gold in a fixed exchange rate system. (sometimes competitive devaluations) and revaluationsWhen the government raises the value of its currency with respect to the reserve currency or to gold in a fixed exchange rate system.. In introductory macroeconomics courses, students learn how government policy levers can be used to influence the level of the gross national product (GNP), inflation rate, unemployment rate, and interest rates. In this chapter, that analysis is expanded to an open economy (i.e., one open to trade) and to the effects on exchange rates and current account balances. A monetary policy (change in MS) has no effect on GNP or the exchange rate in a fixed exchange system. As such, the trade balance, unemployment, and interest rates all remain the same as well. Monetary policy becomes ineffective as a policy tool in a fixed exchange rate system. Expansionary fiscal policy (↑G, ↑TR, or ↓T) causes an increase in GNP while maintaining the fixed exchange rate and constant interest rates. The trade balance and unemployment are both reduced. Contractionary fiscal policy (↓G, ↓TR, or ↑T) reduces GNP while maintaining the fixed exchange rate and constant interest rates. The trade balance and unemployment both rise. A competitive devaluation lowers the currency value and causes an increase in GNP. Unemployment falls, interest rates remain the same, and the trade balance rises. A currency revaluation raises the currency value and causes a decrease in GNP. Unemployment rises, interest rates remain the same, and the trade balance falls. Monetary expansion by the reserve currency country forces the domestic country to run a balance of payments surplus to maintain its fixed exchange rate. The resulting money supply increase causes domestic interest rates to fall to maintain equality with the falling foreign interest rates. Domestic GNP remains fixed, as do unemployment and the trade balance. A currency crisis arises when a country runs persistent balance of payments deficits while attempting to maintain its fixed exchange rate and is about to deplete its foreign exchange reserves. A crisis can force a country to devalue its currency or move to a floating exchange rate. To postpone the crisis, countries can sometimes borrow money from organizations like the International Monetary Fund (IMF). Anticipation of a balance of payments crisisOccurs when the country is about to run out of foreign exchange reserves because of persistent balance of payments deficits. can induce investors to sell domestic assets in favor of foreign assets. This is called capital flightRefers to investors purchasing assets abroad in anticipation of an imminent currency devaluation or depreciation, often in the midst of a balance of payments crisis.. Capital flight will worsen a balance of payments problem and can induce a crisis to occur. 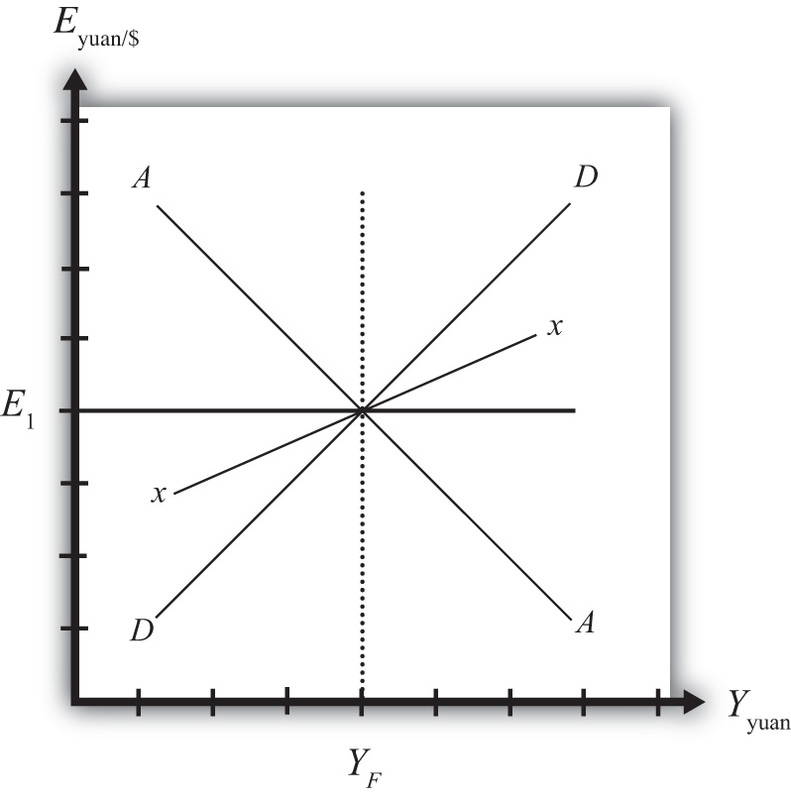 The AA-DD model was developed to describe the interrelationships of macroeconomic variables within an open economy. Since some of these macroeconomic variables are controlled by the government, we can use the model to understand the likely effects of government policy changes. The main levers the government controls are monetary policy (changes in the money supply), fiscal policy (changes in the government budget), and exchange rate policy (setting the fixed exchange rate value). In this chapter, the AA-DD model is applied to understand government policy effects in the context of a fixed exchange rate system. In Chapter 10 "Policy Effects with Floating Exchange Rates", we considered these same government policies in the context of a floating exchange rate system. In Chapter 13 "Fixed versus Floating Exchange Rates", we’ll compare fixed and floating exchange rate systems and discuss the pros and cons of each system. It is important to recognize that these results are what “would” happen under the full set of assumptions that describe the AA-DD model. These effects may or may not happen in reality. Nevertheless, the model surely captures some of the simple cause-and-effect relationships and therefore helps us to understand the broader implications of policy changes. Thus even if in reality many more elements (not described in the model) may act to influence the key endogenous variables, the AA-DD model at least gives a more complete picture of some of the expected tendencies. The main objective of the AA-DD model is to assess the effects of monetary, fiscal, and exchange rate policy changes. It is important to recognize that these results are what “would” happen under the full set of assumptions that describes the AA-DD model; they may or may not accurately describe actual outcomes in actual economies. Of appreciation, depreciation, or no change, the effect of expansionary monetary policy on the domestic currency value under fixed exchange rates in the AA-DD model. Of increase, decrease, or no change, the effect of contractionary monetary policy on GNP under fixed exchange rates in the AA-DD model. Of increase, decrease, or no change, the effect of expansionary monetary policy on the current account deficit under fixed exchange rates in the AA-DD model. Of increase, decrease, or no change, the effect of contractionary monetary policy on the current account surplus under fixed exchange rates in the AA-DD model. Of appreciation, depreciation, or no change, the effect of expansionary fiscal policy on the domestic currency value under fixed exchange rates in the AA-DD model. Of increase, decrease, or no change, the effect of contractionary fiscal policy on GNP under fixed exchange rates in the AA-DD model. Of increase, decrease, or no change, the effect of expansionary fiscal policy on the current account deficit under fixed exchange rates in the AA-DD model. Of increase, decrease, or no change, the effect of a devaluation on GNP under fixed exchange rates in the AA-DD model. Of increase, decrease, or no change, the effect of a revaluation on the current account deficit under fixed exchange rates in the AA-DD model. The term used to describe a rapid purchase of foreign investments often spurred by the expectation of an imminent currency devaluation. The term used to describe the situation when a central bank runs persistent balance of payments deficits and is about to run out of foreign exchange reserves. Learn how changes in monetary policy affect GNP, the value of the exchange rate, and the current account balance in a fixed exchange rate system in the context of the AA-DD model. In this section, we use the AA-DD model to assess the effects of monetary policy in a fixed exchange rate system. Recall from Chapter 7 "Interest Rate Determination" that the money supply is effectively controlled by a country’s central bank. In the case of the United States, this is the Federal Reserve Board, or the Fed. When the money supply increases due to action taken by the central bank, we refer to it as expansionary monetary policy. If the central bank acts to reduce the money supply, it is referred to as contractionary monetary policy. Methods that can be used to change the money supply are discussed in Chapter 7 "Interest Rate Determination", Section 7.5 "Controlling the Money Supply". Suppose the United States fixes its exchange rate to the British pound at the rate Ē$/£. This is indicated in Figure 12.1 "Expansionary Monetary Policy with a Fixed Exchange Rate" as a horizontal line drawn at Ē$/£. Suppose also that the economy is originally at a superequilibrium shown as point F with original gross national product (GNP) level Y1. Next, suppose the U.S. central bank (the Fed) decides to expand the money supply by conducting an open market operation, ceteris paribus. Ceteris paribus means that all other exogenous variables are assumed to remain at their original values. A purchase of Treasury bonds by the Fed will lead to an increase in the dollar money supply. As shown in Chapter 9 "The AA-DD Model", Section 9.5 "Shifting the AA Curve", money supply changes cause a shift in the AA curve. More specifically, an increase in the money supply will cause AA to shift upward (i.e., ↑MS is an AA up-shifter). This is depicted in the diagram as a shift from the red AA to the blue A′A′ line. The money supply increase puts upward pressure on the exchange rate in the following way. First, a money supply increase causes a reduction in U.S. interest rates. This in turn reduces the rate of return on U.S. assets below the rate of return on similar assets in Britain. Thus international investors will begin to demand more pounds in exchange for dollars on the private Forex to take advantage of the relatively higher RoR of British assets. In a floating exchange system, excess demand for pounds would cause the pound to appreciate and the dollar to depreciate. In other words, the exchange rate E$/£ would rise. In the diagram, this would correspond to a movement to the new A′A′ curve at point G.
However, because the country maintains a fixed exchange rate, excess demand for pounds on the private Forex will automatically be relieved by Fed intervention. The Fed will supply the excess pounds demanded by selling reserves of pounds in exchange for dollars at the fixed exchange rate. As we showed in Chapter 10 "Policy Effects with Floating Exchange Rates", Section 10.5 "Foreign Exchange Interventions with Floating Exchange Rates", Fed sales of foreign currency result in a reduction in the U.S. money supply. This is because when the Fed buys dollars in the private Forex, it is taking those dollars out of circulation and thus out of the money supply. Since a reduction of the money supply causes AA to shift back down, the final effect will be that the AA curve returns to its original position. This is shown as the up and down movement of the AA curve in the diagram. 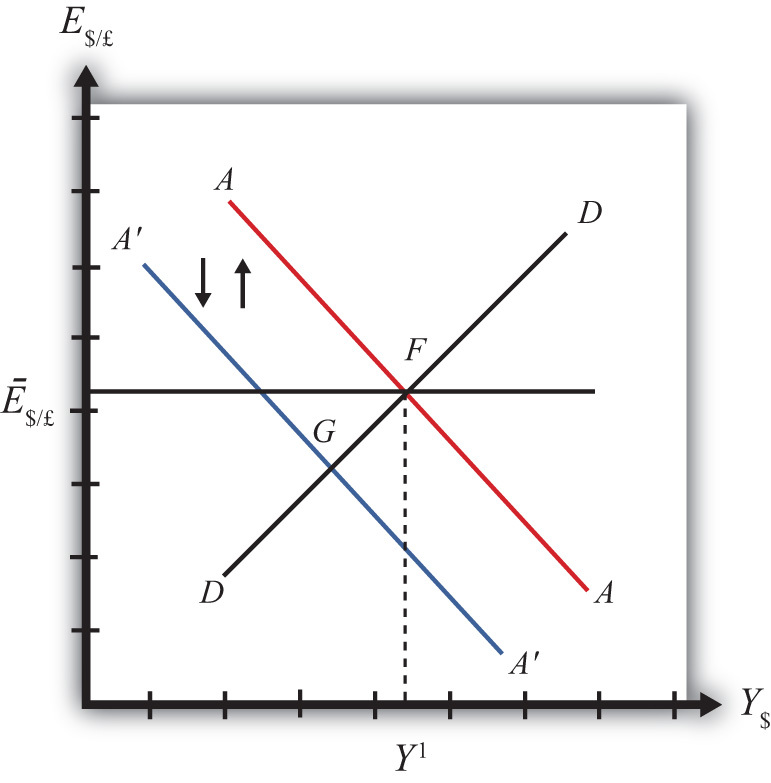 The final equilibrium is the same as the original at point F.
The AA curve must return to the same original position because the exchange rate must remain fixed at Ē$/£. This implies that the money supply reduction due to Forex intervention will exactly offset the money supply expansion induced by the original open market operation. Thus the money supply will temporarily rise but then will fall back to its original level. Maintaining the money supply at the same level also assures that interest rate parity is maintained. Recall that in a fixed exchange rate system, interest rate parity requires equalization of interest rates between countries (i.e., i$ = i£). If the money supply did not return to the same level, interest rates would not be equalized. Thus after final adjustment occurs, there are no effects from expansionary monetary policy in a fixed exchange rate system. The exchange rate will not change and there will be no effect on equilibrium GNP. Also, since the economy returns to the original equilibrium, there is also no effect on the current account balance. Contractionary monetary policy corresponds to a decrease in the money supply or a Fed sale of Treasury bonds on the open bond market. In the AA-DD model, a decrease in the money supply shifts the AA curve downward. The effects will be the opposite of those described above for expansionary monetary policy. A complete description is left for the reader as an exercise. The quick effects, however, are as follows. U.S. contractionary monetary policy with a fixed exchange rate will have no effects within the economy. E$/£, Y$ and the current account balance will all be maintained or return to their initial levels. This result indicates that monetary policy is ineffective in influencing the economy in a fixed exchange rate system. In contrast, in a floating exchange rate system, monetary policy can either raise or lower GNP, at least in the short run. Thus monetary policy has some effectiveness in a floating system, and central bank authorities can adjust policy to affect macroeconomic conditions within their economy. For example, if the economy is growing only sluggishly, or perhaps is contracting, the central bank can raise the money supply to help spur an expansion of GNP, if the economy has a floating exchange rate. However, with a fixed exchange rate, the central bank no longer has this ability. This explains why countries lose monetary autonomy (or independence) with a fixed exchange rate. The central bank can no longer have any influence over the interest rate, exchange rate, or the level of GNP. One other important comparison worth making is between expansionary monetary policy in a fixed exchange rate system with sterilized foreign exchange (Forex) interventions in a floating system. In the first case, expansionary monetary policy is offset later with a contraction of the money supply caused by automatic Forex intervention. In the second case, Forex intervention leading to an expansion of the money supply is countered with contractionary open market operations. In the first case, the interest rate is maintained to satisfy interest rate parity. In the second case, the interest rate remains fixed by design. Clearly, these two situations represent exactly the same set of actions, though in a different order. Thus it makes sense that the two policies would have the same implications—that is, “no impact” on any of the economic variables. There are no effects from expansionary or contractionary monetary policy in a fixed exchange rate system. The exchange rate will not change, there will be no effect on equilibrium GNP, and there will be no effect on the current account balance. Monetary policy in a fixed exchange rate system is equivalent in its effects to sterilized Forex interventions in a floating exchange rate system. Learn how monetary policy in the foreign reserve country affects domestic GNP, the value of the exchange rate, and the current account balance in a fixed exchange rate system in the context of the AA-DD model. Suppose the United States fixes its exchange rate to the British pound. In this circumstance, the exchange rate system is a reserve currency standard in which the British pound is the reserve currency. The U.S. government is the one that fixes its exchange rate and will hold some quantity of British pounds on reserve so it is able to intervene on the Forex to maintain the credible fixed exchange rate. It is worth noting that since the United States fixes its exchange rate to the pound, the British pound is, of course, fixed to the U.S. dollar as well. Since the pound is the reserve currency, however, it has a special place in the monetary system. The Bank of England, Britain’s central bank, will never need to intervene in the Forex market. It does not need to hold dollars. Instead, all market pressures for the exchange rate to change will be resolved by U.S. intervention, that is, by the nonreserve currency country. Now let’s suppose that the reserve currency country, Britain, undertakes expansionary monetary policy. We will consider the impact of this change from the vantage point of the United States, the nonreserve currency country. Suppose the United States is originally in a superequilibrium at point F in the adjoining diagram with the exchange rate fixed at Ē$/£. An increase in the British money supply will cause a decrease in British interest rates, i£. As shown in Chapter 9 "The AA-DD Model", Section 9.5 "Shifting the AA Curve", foreign interest rate changes cause a shift in the AA curve. More specifically, a decrease in the foreign interest rate will cause the AA curve to shift downward (i.e., ↓i£ is an AA down-shifter). 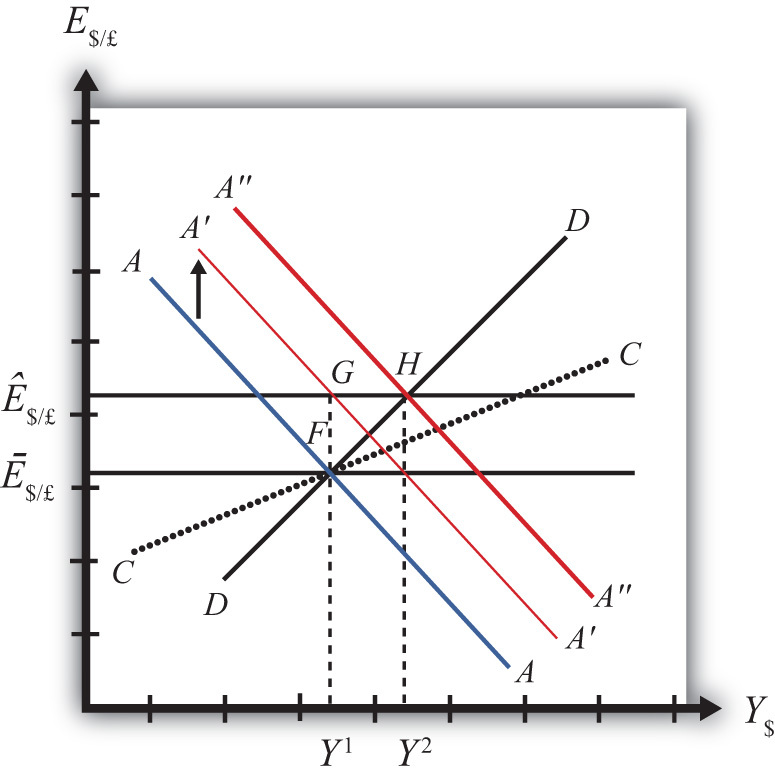 This is depicted in Figure 12.5 "Expansionary Monetary Policy by a Reserve Country" as a shift from the red AA to the blue A′A′ line. The money supply decrease puts downward pressure on the exchange rate in the following way. When British interest rates fall, it will cause i£ < i$ and interest rate parity (IRP) will be violated. Thus international investors will begin to demand more dollars in exchange for pounds on the private Forex to take advantage of the relatively higher rate of return on U.S. assets. In a floating exchange system, excess demand for dollars would cause the dollar to appreciate and the pound to depreciate. In other words, the exchange rate (E$/£) would fall. 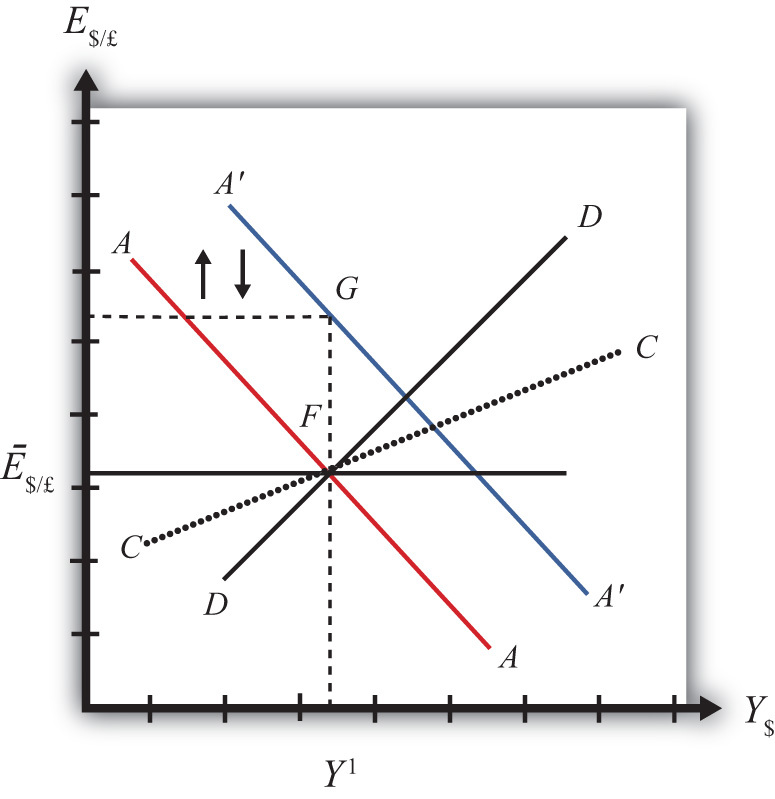 In the diagram, this would correspond to a movement to the new A′A′ curve at point G.
Because the country maintains a fixed exchange rate, however, excess demand for dollars on the private Forex will automatically be relieved by the U.S. Federal Reserve (or the Fed) intervention. The Fed will supply the excess dollars demanded by buying pounds in exchange for dollars at the fixed exchange rate. As we showed in Chapter 10 "Policy Effects with Floating Exchange Rates", Section 10.5 "Foreign Exchange Interventions with Floating Exchange Rates", the foreign currency purchases by the Fed result in an increase in the U.S. money supply. This is because when the Fed sells dollars in the private Forex, these dollars are entering into circulation and thus become a part of the money supply. Since an increase in the money supply causes AA to shift up, the AA curve will return to its original position to maintain the fixed exchange rate. This is shown as the up-and-down movement of the AA curve in the diagram. Thus the final equilibrium is the same as the original equilibrium at point F.
Remember that in a fixed exchange rate system, IRP requires equalization of interest rates between countries. When the British interest rates fell, they fell below the rates in the United States. When the U.S. Fed intervenes on the Forex, however, the U.S. money supply rises and U.S. interest rates are pushed down. Pressure for the exchange rate to change will cease only when U.S. interest rates become equal to British interest rates and IRP (i£ = i$) is again satisfied. Thus after final adjustment occurs, expansionary monetary policy by the foreign reserve currency country in a fixed exchange rate system causes no effects on U.S. GNP or the exchange rate. Since the economy also returns to the original equilibrium, there is also no effect on the current account balance. Fed intervention in the Forex to maintain the fixed exchange rate, however, will cause U.S. interest rates to fall to maintain IRP with the lower reserve country interest rates. Contractionary monetary policy corresponds to a decrease in the British money supply that would lead to an increase in British interest rates. In the AA-DD model, an increase in foreign interest rates shifts the AA curve upward. The effects will be the opposite of those described above for expansionary monetary policy. A complete description is left for the reader as an exercise. Expansionary monetary policy by the foreign reserve currency country in a fixed exchange rate system causes no effects on domestic GNP, the exchange rate, or the current account balance in the AA-DD model. However, it will cause domestic interest rates to fall. Contractionary monetary policy by the foreign reserve currency country in a fixed exchange rate system causes no effects on domestic GNP, the exchange rate, or the current account balance in the AA-DD model. However, it will cause domestic interest rates to rise.